Have you been through Williams-Sonoma, Target, Macy’s, or Sur La Table to see their featured kitchen gadgets? If you are a zealous cook, and have a love for being in the kitchen to cook for others or just to relieve stress, then you can’t help but search out and admire the latest tools of the trade, in this case the most necessary kitchen gadgets. After you have eyed all of those gadgets, you ask which ones do I really need? Here is a look at four of the most useful kitchen aids that we think will help make your cooking and baking time in the kitchen more of a breeze. Microplane graters are very useful for grating a verity of foods , like nutmeg, cheese, and zest from citrus fruit. The microplane is etched instead of stamped, like the box grater is. 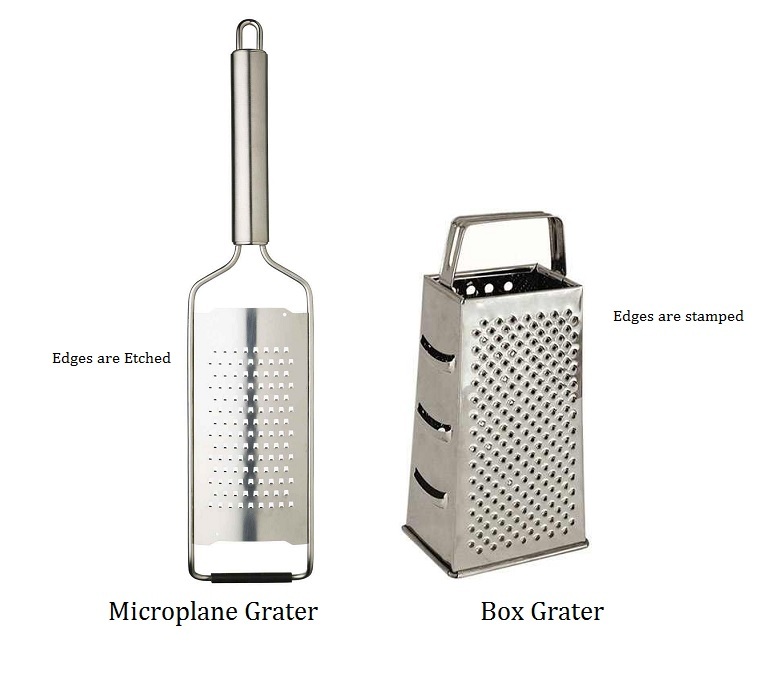 The microplanes etched edges are razor sharp, grating the food items even finer, then the the smaller stamped grater side of the box grater. Citrus zest is a healthy way to add seasoned flavor to your favorite recipes. The microplane can easily zest any citrus rind without piercing the pith. 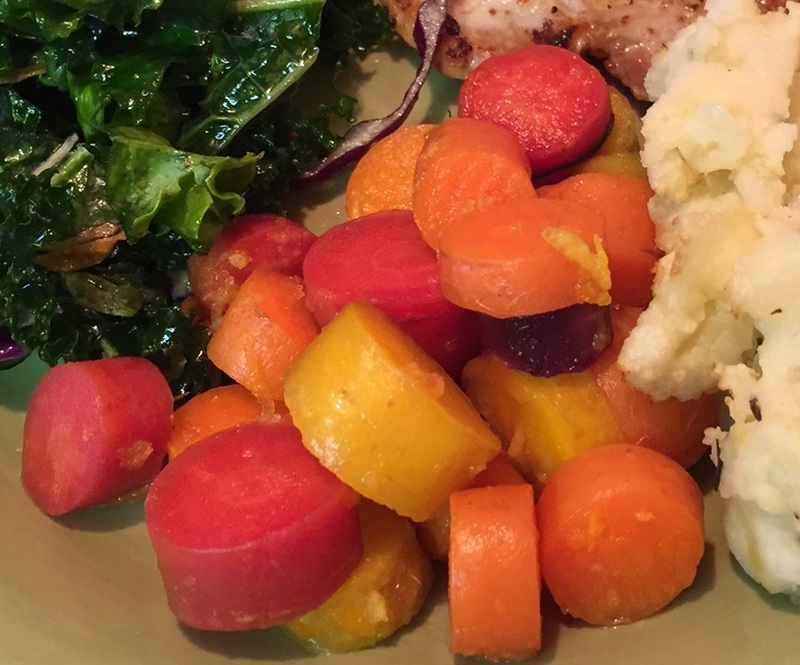 Try a side of steamed or roasted rainbow carrots, sliced and mixed with ginger syrup and the zest of an orange. A microplane will also grate the perfect chocolate shavings for a cake, or some hard Asiago cheese to grate over your favorite pasta or even a pizza. 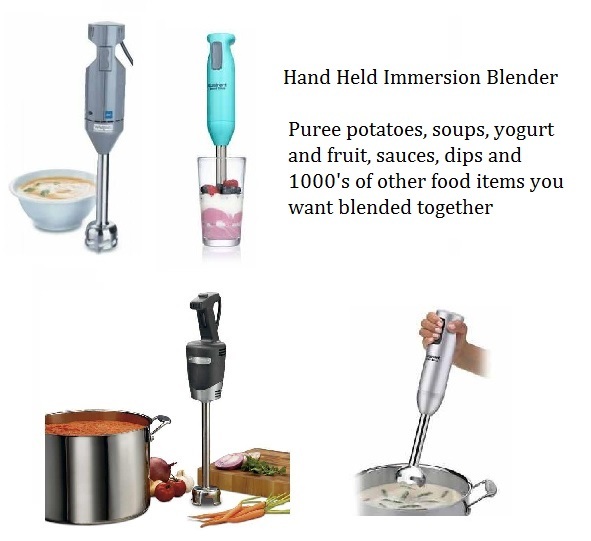 The immersion blender allows you to puree nutritious soups and dips without straining your wrist. Some of the hand held blenders have multi-speeds making it easier to work on thick or denser concoctions, taking only 90 seconds to puree thick soups like split pea and ham , or chunky spaghetti sauce into a pureed spaghetti sauce. A handheld immersion blender saves you time, as you don’t have to get your blender out to puree the soup or other food items, and less clean-up. An angled measuring cup by OXO makes measuring foods that are easy to underestimate when cooking or baking, such as flour, cooking oils, pasta, cereal, and nuts. The angled measuring cup has measurement markings visible from above, making it easier to add accurate amounts of ingredients to your cooking or baking and eliminating the need to examine amounts at eye level. Sanitation is important when using cutting boards. Bacteria can reside in grooves produced by cutting, or in liquids left on the board, either it be a wooden or plastic cutting board. Bacteria or allergens can easily be transmitted from one part of the kitchen to another or from one food to another by way of cutting knives, hands, or surfaces such as chopping boards. 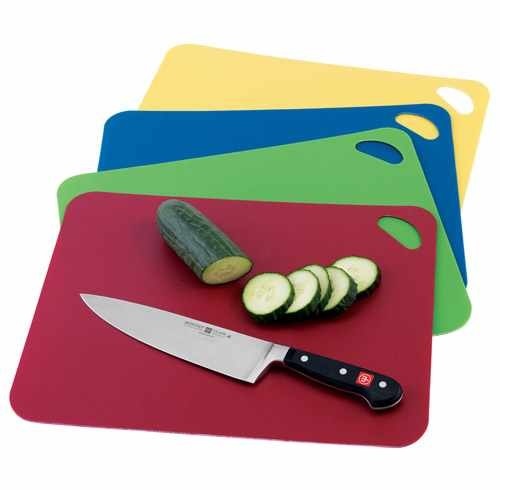 To reduce the chance of cross contamination, why not use flexible cutting boards, which are of different colors for use with different types of food such as raw meat, cooked meat, dairy and vegetables. 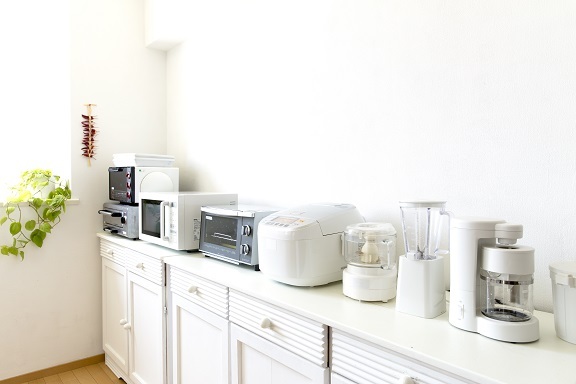 Many professional kitchens follow this standard color-coding system. Remember that stocking your kitchen with the appropriate tools of the trade doesn’t have to be expensive. Shop around and investigate and read up on product reviews, such as those done by Good House Keeping , Eating Well, Consumer Search , with the reviews posted on their websites. This entry was posted in Reviews - Kitchen Utensils - Cooking - Food and tagged angled measuring cup, box grater, citrus zest, colored flexible cutting boards, Cutting Boards, flexible cutting boards, immersion blender, kitchen gadgets, Measuring cup, microplane, microplane grater, OXO, Pizza, Sur La Table, Tomato sauce, Williams-Sonoma. Bookmark the permalink. Great article. Time to get that long-overdue micro-planer! My wife is the same. I buy all of the gadgets, but I am the only one to use them. Thanks! I see a few things that I can maybe get hubby for the kitchen. We do have that measuring cup already. I love it!